Port Newton, California in 1900 is hardly a prosperous community. The owner of the local Savings & Loan has embezzled the town's money, leaving many penniless and destitute. Once thriving industries have left the city. And, perhaps the ultimate insult to the inhabitants of this tiny burg, their baseball team is in the midst of a years' long losing streak. This is the realm brought vividly to life in The Fade-Away by George Jansen. A world of characters is paraded before us, each colorfully described and vividly portrayed. "Doc" Sam Fuller, the local physician and president of the Port Newton Athletic Club. Gerald "Foghorn" Murphy, owner of the Railroad Exchange Saloon, Long John Sheets, the town constable, and Sophie Fuller, the high school senior who keeps a diary of town events. But when an Indian by the name of John Poe Dobbs quite literally washes into town, things begin to change, the former baseball star shining a light of hope over the bleak city. 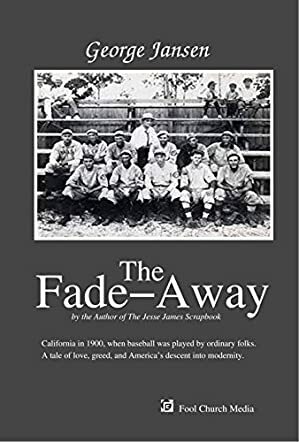 The Fade-Away refers to the pitching style employed by Dobbs, and much of the novel revolves around the game of baseball, though it isn't so much that someone like me, who is hardly a baseball expert, can't enjoy it. The story is marvelously told from a variety of viewpoints, each possessing a unique style and voice. From the colorful journalistic jargon employed by the local newspaper, to the rambling musings of a teenager trying to grow up in the stifling atmosphere, to the matter-of-fact delivery of the physician, each voice rings true, bringing its own perspective to town events. George Jansen has hit a home run with The Fade-Away, offering a solid story line, an accurate portrayal of life at the turn of the century, and a cast of characters you'll grow to love. A great treat for fans of historical novels, The Fade-Away by George Jansen presents life in a small town, Port Newton. It’s a town with its own baseball team, even if it is suffering because of the youth moving away to bigger cities. The story starts with a dramatic event — an unconscious man floating into town. When Constable Long John pulls an American Indian, a tall man wearing a tuxedo, from the water, he is unconscious, and the incident sets off a chain of events that will affect every part of community life around Foghorn Murphy's Railroad Exchange Saloon. This is a beautiful tale that explores love, greed, and power. But it is also a wonderful portrait of what America looked and felt like at the dawn of a new century. George Jansen has a unique gift for storytelling and his inimitable voice grips the reader right off the bat. I was enticed by the quirkiness in the narrative voice, the vivid, somewhat humorous descriptions of scenes and characters, and the author’s deft handling of both the conflict and the plot points. The narrative is gripping and emotionally charged. The characters leap off the pages, each crafted with a life of their own and a role that is clearly defined. The measured use of backstory keeps the narrative alive. The prose is clear and enjoyable, punctuated by exciting dialogues. The Fade-Away has a great setting and I loved the way the author explores the physical, cultural, and political aspects of the setting, allowing each element to fall neatly into the literary tapestry. It is a very enjoyable read, transporting and rollicking. The Fade-Away is a complex work of historical fiction written by author George Jansen which focuses particularly on a small town sports team with a quirky difference. This baseball team in the heart of Port Newton, in San Francisco Bay, is made up of down and outs looking to improve their luck. Despite all the eligible men moving onto bigger and better things, the year 1900 signifies a new horizon for the team. On Friday the 13th, of all dates, the local constable uncovers a six-foot, tuxedo-clad American Indian in the Bay, and his awakening promises to take the team and the town to all-new heights of excitement. This was an unusual tale, but one that I enjoyed very much. Turn of the century American history is not an area which I know a great deal about, so seeing this small town in California brought to life with excellent descriptions and a well researched historical context was a treasure for me. Author George Jansen crafts a beautiful tale full of wit and humor as he brings his bizarre collection of locals to life. Everyone has heart and faith in love and the American ideals, but the story is told with a watchful eye over the direction in which big money is taking society. Amid the strange small-towners and their funny ways, there’s a large message brewing which is very clever and enjoyable to uncover. Overall, I’d definitely recommend The Fade-Away to all fans of distinctive culture and American history. The Fade-Away by George Jansen is a historical novel with powerful cultural themes, and tale that speaks of the transition to modernity. The reader is introduced to the life of a small time baseball team with its squabbles, the events that punctuate its life. With the young moving away from Port Newton to bigger cities, this has a very bad effect on the baseball team. But then something unusual happens — a tall American Indian wearing a tuxedo is pulled out of the water, unconscious, by Constable Long John and this event is about to change a lot of things in Foghorn Murphy's Railroad Exchange Saloon. Follow this unusual tale of love and greed and a community’s journey into the twenty-first century. George Jansen is a great storyteller, one of those writers who succeed in grabbing my attention from the very start of their story. The opening of the novel has many elements that make it intriguing. The author gives us an idea of the period in which the narrative takes place and then, in an intriguing way, announces an event. It's Eastertide and Good Friday in Railroad Exchange Saloon in Port Newton, California when Jack Dobbs “floated into town." The writing is gorgeous and the diction reflects the historical period in which the story takes place. The Fade-Away features very interesting characters and explores relationships within a small community, both business and personal, providing readers with social and cultural commentaries that allow them to feel the soul of a people. The author combines humor with suspense to make the reading experience a delightful one.